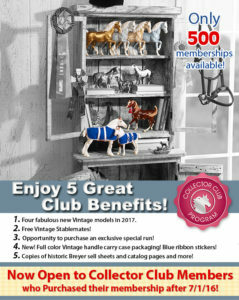 Home » Model Horse	» The Breyer 2017 Vintage Club Is Open To New Members! The Breyer 2017 Vintage Club Is Open To New Members! Breyer 2017 Vintage Club News! While I am tempted to join, I think that I will pass on the Vintage Club for next year. Will you be joining the Breyer 2017 Vintage Club? « Winners Are Drawn! Did You Get an Avalanche?